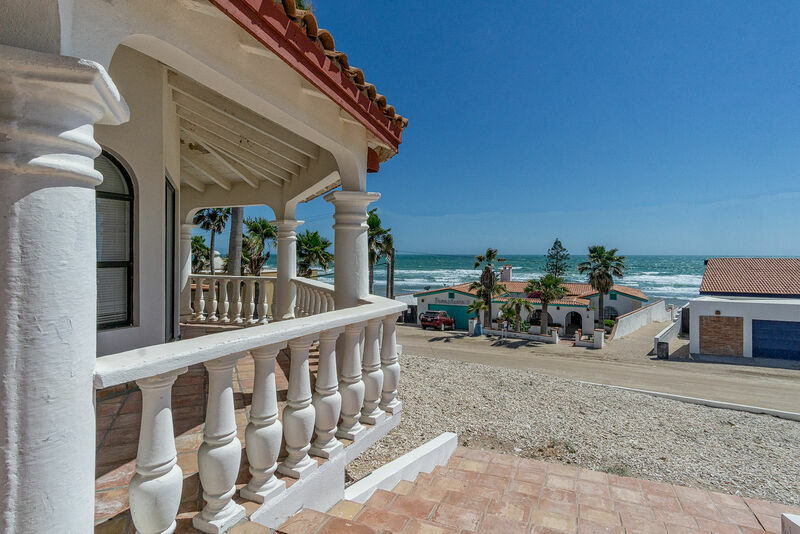 The Estrella del Mar home is a beautiful ocean view home located in Section 3 of the Las Conchas housing subdivision. This lovely home has 3 bedrooms with 2 bathrooms and accommodations for up to 6 guests. The home has an upper level sundeck as well as a front and back porch. This home includes a 2 car garage and plenty of additional space for more vehicles. You can get to the beach easily by walking across the street and following the path down to the sand. The living room of the home has Saltillo tile flooring with 2 matching black suede sofas, a glass top coffee table and two lighted end tables. The room has a built in fire place with a beautiful decorated mantle which is lovely on those chilly Rocky Point evenings. The media unit on the other side of the room has a large Flat screen TV, and DVD. In the dining room there are two separate dining tables; one for the kids and one for the adults. The dining table has a stone top with four chairs. The room includes a large china cabinet, and a window that looks out to the ocean. The kitchen is very open with lots of room. The kitchen has tan ceramic tiled counter top with a checkered colorful ceramic tile trim and back splash. The kitchen includes all major appliances and fully stocked cabinets. The counter is also furnished with a coffee maker, blender, toaster and mixer. There is a built in counter bar. The 1st bedroom has a king size bed with brown and beige checkered bedding. The room includes two lighted wood bed side tables and a wall mounted art print above the bed. The room has room brightening windows, a dresser and a large double door closet to hang your clothing. The 2nd bedroom has a queen size wood framed bed with a looped head board and peach colored bedding. The room includes a lighted nightstand, corner window, dresser and a beautiful wall mounted art design. The 3rd bedroom has a set of twin size wood framed beds with matching tan and orange striped bed spreads. The room has one bed side tables, a large double door armoire and double door closet where you can hang your clothing. The porch and sundeck provide some of the most beautiful views you will ever see. You could grill up a fresh seafood meal on the BBQ and dine outside while you watch the sunset over the Sea of Cortez. Relax on the porch in the evenings and listen to the sounds of the tide rolling in and out. You could sunbathe on the 2nd level sundeck while you sip on a margarita or enjoy a good book. This is a very comfortable home with everything you need to feel right at home. The location and accommodations are just perfect. You should check now for rates and availability. No washer and Dryer available, No satellite, No sofa-bed.